These deals can create jobs or ship them overseas. They can foster growth that supports our social programs or put these programs at risk. They can promote human rights abroad or undermine Canadian values at home. And they can enrich our communities with new opportunities — or hollow them out. This isn’t a "free trade" against "protectionism" debate. This century’s economic challenges compel us to move beyond the old "free trade" model of blanket deregulation alongside unfettered foreign access to Canadian resources. Instead, we need domestic policies that help us take full advantage of opportunities on the global front. Effective trade agreements can open doors for our businesses without tying our hands at home. Our trade minister forgets how Canada became one of the world’s best places to live. We owe a great deal to progressive industrial and social policies that fostered a strong, family-supporting domestic economy — and sought to ensure its survival in a competitive world. New Democrats believe trade must be a priority, but every agreement should deliver a clear net benefit to Canada. This means bargaining hard for deals that open up new markets while protecting Canada’s public services; fostering quality job creation by promoting exports of value-added goods over bulk exports of raw materials; and making sure public health, environmental and human-rights concerns are front and centre. An NDP government would ensure a full and open assessment of any proposed trade agreement’s impact on our families and communities, so we can have a vigorous public dialogue and make informed choices. Unlike this Conservative government, New Democrats trust Canadians to be part of this debate. The federal government believes some 1,800 people have obtained their Canadian citizenship through fraudulent means and it intends to revoke their status, Postmedia News has learned. After a lengthy investigation by police and the department of Citizenship and Immigration, letters have been issued to hundreds of Canadians telling them the federal government intends to revoke their citizenship. Individuals can challenge the decision in Federal Court but if they don't, cabinet will move to void their passports and strip them of their citizenship. I haven't seen much commentary yet on what that process actually means. So let's unpack it to see just how the Cons see Canadian citizenship. The apparent starting point for the Cons' action is based on nothing more than what they "believe". There's no indication as to what evidence, if any, there is to support the letters of intention sent out this week - no reason indeed why the Cons couldn't simply be picking the name of immigrants out of a hat (or worse yet, targeting specific groups with no reasonable basis for doing so) in assembling their list. From there, the onus is being placed on Canadian citizens to go to the trouble of going to court to avoid having their citizenship revoked. And it's particularly noteworthy that the Cons aren't the least bit open to considering citizens' positions at the applicant level; instead, they don't plan to even consider reversing their decisions (however unsupported) unless a court orders them to. Of course, that will result in massive costs to anybody who wants to challenge the Cons' arbitrary decision. And it wouldn't be surprising at all if many of the immigrants targeted by the Cons have trouble proving the circumstances of their arrival and application for citizenship; after all, what reason would most have had to think they'd need to preserve evidence of how they became Canadian after making the effort to secure citizenship? In sum, it's bad enough that the Cons think it's their job to try to slash Canada's citizenship rolls. But it's even more telling that they've chosen a process which involves zero accountability or willingness to listen to individual circumstances, combined with a maximum amount of formality and cost in trying to have any mistakes reversed. And the lesson for immigrants across the country can only be that as long as the Cons are in power, it's dangerous to think one is safe in Canada. - Jeffrey Simpson laments the Cons' evidence-averse crime policies. But it's worth noting that Simpson is off base on one point: much as he assumes that years of spin from the Cons and the media alike have pushed the public to fear for their safety at every turn and thus vote for dumb-on-crime rhetoric at any cost, it just ain't so. - Gerald Caplan is right to note that for as much damage as they're doing at home, the Harper Cons seem downright moderate compared to some of their right-wing counterparts around the globe. But it's worth recognizing that he forms part of the same global movement - meaning that the disastrous examples abroad serve more as portents of what's to come than as evidence that Harper isn't so bad after all. - Dan Gardner treats like things alike. Mayhem ensues. - Finally, Shauna MacKinnon highlights Manitoba's Poverty Reduction Strategy Act, even while recognizing that it's only one step toward ending poverty in the province. If there's any good news in the report that it's apparently impossible to keep corporate sponsorship off even the most political of public functions, it's that it should be highly entertaining to see where the trend goes next. I for one look forward to the Harper Cons responding to all media questioning with "This 'no comment' brought to you by Suncor". So can Canadian progressives agree that eliminating environmental regulators is generally a short-sighted move which prioritizes a foolish focus on slashing government gratuitously over a society's long-term well-being? Of course, I ask for no particular reason. (T)here’s a glaring lie by omission in the summary for this document: although the Fraser Institute really wants you to know that we spend about the same amount as the Americans do on drugs, what they don’t think you need to know is that, according to their own numbers, we actually spend almost 21% less per prescription than the Americans do. So government controls work, if not as well as we might hope, and the Fraser Institute wants to get rid of them anyways. Secondly, the most interesting thing about healthcare comparisons is that Canadian brand-name drugs cost half as much as in America, but our generic drugs cost twice as much. Both are due to government price controls: our government forces prices low on brand-name drugs, but also allows generic drugmakers to charge high prices. You might think the solution, if the goal is lower drug prices for consumers, is to impose lower price controls on the generic market, or even just to let it float freely, like the Americans do. That’s not the Fraser Institute’s solution. They say if you completely deregulate the industry, then the drugmakers will drop the prices on generic drugs, but they’ll still respect the artificially low rates for brand-name drugs. This sort of economic wizardry is exactly why we should take the Fraser Institute and dump them into the sea — an economical solution because they’re already near the ocean. (The Cons' plan) is a second-best solution and a poor substitute for strengthening the Canada Pension Plan, which covers the entire working population, is mandatory for all employers and employees, has worked well for 45 years and is actuarially sound for the next 75 years. The only problem with the Canada Pension Plan is that it doesn’t provide enough to live on. The average annual payout is $6,150 a year. Even when that is combined with Old Age Security — the universal payment to all Canadians over 65 — the average is just $12,100, which falls roughly $6,800 below the poverty line. That was fine when it was a supplement to the workplace pensions that most families could count on a generation ago. But today, 11 million workers have no pension. Many have no retirement savings at all. Academics, actuaries, nonbank economists, labour leaders and seniors have urged the government since the recession to expand the Canada Pension Plan. Polls show Canadians would be willing to increase their contributions to assure themselves and others a dignified retirement. The Conservatives are offering a less comprehensive, less reliable alternative. - The Ottawa Citizen decries the Cons' willingness to run billions of public dollars through a shredder for the sake of posturing on crime. And Daphne Bramham notes that the prison-industrial complex is making inroads in B.C. as a result. - Finally, Mike Smith's take on how to get anything done at the municipal level is well worth a read. An environmental monitoring plan explicitly designed to improve the reputation of the industry involved is a thoroughly useless environmental monitoring plan. Neo-liberals tend to favor a combination of market mechanisms and technocratic solutions to solve social problems. But these kinds of solutions tend to discount politics – and in particular political collective action, which requires strong collective actors such as trade unions. This means that vaguely-leftish versions of neo-liberalism often have weak theories of politics, and in particular of the politics of collective action. I see Doug and others as arguing that successful political change requires large scale organized collective action, and that this in turn requires the correction of major power imbalances (e.g. between labor and capital). They’re also arguing that neo-liberal policies at best tend not to help correct these imbalances, and they seem to me to have a pretty good case. Even if left-leaning neo-liberals are right to claim that technocratic solutions and market mechanisms can work to relieve disparities etc, it’s hard for me to see how left-leaning neo-liberalism can generate any self-sustaining politics. I’m sure that critics can point to political blind spots among lefties (e.g. the difficulties in figuring out what is a necessary compromise, and what is a blatant sell-out), but these don’t seem to me to be potentially crippling, in the way that the absence of a neo-liberal theory of politics (who are the organized interest groups and collective actors who will push consistently for technocratic efficiency?) is. - Yes, the Cons have been told that environmental protection is important, including for economic reasons. No, they don't care in the slightest. Yes, this is a scandal. - But then, maybe the Cons are just too busy looking for corporate money-making opportunities to act on what they know about the environment. And who won't feel better knowing that search-and-rescue operations are being carried out by the lowest bidder? - Finally, it's great news that SaskTel will be connecting 28 First Nations communities with high-speed Internet and wireless coverage. But to fully appreciate the importance of the step, it's also worth highlighting how long the same connections would likely have taken if the private sector were left to its own devices. Here, on how the TILMA's regressive trade rules are spreading across Canada in other forms. - I've posted several times before about just some of the problems with the TILMA and the arguments made in favour of it, while also comparing it with the AIT as it stood a couple of years ago and highlighting how it's been replicated in the NWPTA. - And for more recent commentary, I'll link again to posts by Erin (X2) and Alison. Is (Brad) Wall so uninformed that he doesn't know about (federal subsidies for the oil sands)? This has been a first edition of frequently-quoted answers to simple questions. In October 2010, the bill was killed by an opposition motion, which passed by a slim margin of 153-151. The motion was supported by 75 Liberals, 48 Bloc Quebecois and 30 New Democrats. Two Independent MPs sided with the 143 Conservatives. Six NDP MPs broke with their party and voted with the government to scrap the registry. This occurred because NDP leader Jack Layton allowed his caucus to vote their conscience by not "whipping" the vote, or compelling them to vote according to the party line. So never mind the explicit recognition that NDP MP's weren't compelled to vote according to a party line at all. If the story demands that one be made up in order to declare that some MPs "broke" it, then so be it. Hicks said Layton can't afford to allow much internal disagreement on the issue because he must demonstrate to Canadians he can control his caucus. "When you're leader of the Opposition, your ability to control your caucus becomes a test of your competence as leader," he said. "Now that Jack Layton lives at Stornoway, this is something he has to tackle in a way he didn't before." Of course, the Libs were able to allow free votes on the gun registry not only in opposition, but also while in power. But now that the NDP has improved its place in Canada's political party standings, the rules have changed - apparently based on little more than spin from the parties who have been left behind. And all this while the Cons have the votes to push through their legislation without any opposition party support. Suffice it to say that once they've rendered the issue moot by doing so, this kind of hackery won't be missed. It’s argued that globalization rewards some of the highly skilled (and people who can manipulate other people’s money, as in hedge funds, banking and financial services), while leaving others behind. Clearly, the struggles of manufacturing in North America and Europe have robbed those societies of millions of good-paying, often unionized, jobs. Some of these have been replaced by better-paying service-sector jobs; most have not. The Conference Board notes that government transfer programs flatten out some inequalities, but not as effectively as 20 years ago. Unemployment benefits go to fewer people; welfare rates haven’t always kept up with the cost of living. Many of the Harper government’s tax cuts, for example, have disproportionately benefited those better off, since they’re not geared to income – as in all those itsy-bitsy bribes for sports equipment, the GST cut and the child benefit cheques than come through the mail every month. Retired graphic arts worker Rene Walti, who relied on saving inside an individual Registered Retirement Savings Plan, said he would be pleased to see his four children benefit from the pooled plan option. Menzies said an expanded CPP “certainly hasn’t been taken off the radar screen,” but provincial finance ministers agreed the pooled plans would be the fastest way to offer Canadians a better savings option. - Dan Gardner is right to note that the Cons' dumb-on-crime strategy is neither entirely new, nor based on a direct attack on historic sentencing principles. But aside from the hope of a shift back in the longer term, is there really much value in avoiding changing the principles used in exercising discretion (in both sentencing and parole) while severely limiting the outcomes that are actually available? - Finally, David Sirota points out why fast food is cheaper than healthier alternatives - with a heavy emphasis on subsidies for major components of the less-healthy food. I know I can't think of a higher priority for Canada at the moment than to declare war on citizenship. Susan Delacourt points out some fascinating research on voter turnout - with the key finding being that citizens are more likely to turn out when prompted to think in terms of "be(ing) a voter" rather than merely voting as a one-time action. And I have to wonder whether the effect might also apply when it comes to other positive types of self-identity. For example, might encouraging people to "be a citizen" do more to promote public involvement (both in terms of initial responses, and a self-image which can build over time) than transactional appeals for money, signatures or links? In addition to the in-and-out fraud cases against the Conservative Party and several of its former senior officials, including two current Senators, Elections Canada has made 23 “compliance agreements” since 2006. In each case, the accused confesses to a violation of the act, usually excuses it away as inadvertent or well-intentioned or the like, and promises to make some trivial amends. In total, during the past five years 7 Conservatives, 1 NDP, 2 Liberal, and 1 unidentified party agent have signed compliance agreements. * During the 2008 election, Winnipeg Conservative candidate Kenny Daodu’s campaign negotiated a $1000 kickback on a lease similar to the Goodyear agreement described below. Once again, there was no apparent punishment. * Also in 2008, Conservative MP Bev Shipley and canditate Yonah Martin (now a Senator) exceeded their campaign spending limits. Their punishments: none apparent. Still in the same year, Liberal MP Blair Wilson failed to report $9000 in expenses; his punishment was “a notation… on the Elections Canada audit file” (oh, no!). * In 2007, now-science minister Gary Goodyear’s staff confessed he had solicited an almost $2000 donation as an illegal kickback on the minister’s campaign office. His punishment: none apparent. * One campaign agent in the 2006 election, not identified, offered gift certificates in exchange for donations. His/her punishment was to mail out a form letter advising that the gift certificates could not be provided and confirming that the donors wished to go ahead with their donation anyways. I wish I could say all parties were equal offenders, because I did start out wanting to write a piece about politicians’ sense of entitlement. And there are offenders in every major party. But it has to be said that only Conservatives have been caught negotiating kickbacks, and they are responsible for a majority of the cases. Maybe the others are just better at covering their tracks, but given that the Conservatives are also in court for party-level electoral fraud, I do have to wonder about this party’s commitment to the rule of law. The Conservatives have learned well. Remember in the old days when they used to holler about the performance of Jean Chrétien’s ethics counsellor, Howard Wilson. Watchdog Wilson, they charged, was a great boon to the Liberals. Present him with allegations of wrongdoing, they said, and inevitably he would find no evidence of wrongdoing. But if the Conservatives thought he was a soft touch, they might want to check the record of their own ethics commissioner, watchkitten Mary Dawson. In four years on the job, working with inadequate legislation, her pursuit of malfeasance has been so relentless and unyielding that on only two occasions has she found that a politician violated ethical standards. That’s from a caseload of allegations numbering in the hundreds.Of the two cases her merciless team of investigators moved on, neither reflected poorly on the government. One was against a Liberal MP. Another was a decision last week against former Conservative MP Helena Guergis for using her position to further the business interests of her husband, Rahim Jaffer. The verdict tended to vindicate Prime Minister Stephen Harper for his decision to dump Ms. Guergis from caucus last year. Ms. Ouimet’s work was such that even former auditor-general Sheila Fraser, who witnessed a lot over the years, was aghast. More than 200 allegations from whistleblowers came before Ms. Ouimet’s office. Nary a one led to redressal. Ms. Ouimet was pilloried in an A-G’s report and left the government with a $500,000 payout and a gag order not to talk about what she did. What she did could hardly have displeased the governing party. Of the hundreds of cases handled by her, who knows how many might have constituted breaches of the public trust. Not to be forgotten is the work of another officer of Parliament, Karen Shepherd, the commissioner of lobbying. Her less than avid record of enforcement must bring smiles to many politicos as well. The (Canadian Tourism Commission), funded with $95-million a year in federal money, is an arms-length body with a board of directors and a mandate to promote Canadian tourism. Their mandate does not specifically include promotion of the minister. - The CCPA highlights income disparities for each Canadian province in slideshow form. - Finally, Alison weighs in on the connections between the TILMA (now being spread across Canada under the guise of the Agreement on Internal Trade) and the CETA. Of course we can find good news for Liberals - just as long as we get creative in defining the term! Update: Actually, there's a serious point to be made here. While it's disingenuous enough to conflate the B.C. and Quebec Libs with the national brand, there's also a key common thread which looks to completely undermine Yaffe's attempt to paint them as good news for the federal party. In both cases, the success of the provincial parties is based in large part on their not having to face a united right - in B.C. because most federal Libs and Cons have made common cause under the Libs' banner, and in Quebec because the province's politics tend to be divided based on factors other than ideology. And the exceptional nature of politics in those two provinces really only serves to highlight the rule that a mushy-middle party is ineffective against a Harper-style right-wing assault. Yes, it's absolutely appalling that federal prison costs have already shot up by 86% under the Harper Cons (by well over a billion per year), and only figure to escalate further. But let's keep in mind that today's news only covers a relatively small part of the story, as some of the more unjustifiable of the Cons' policies (e.g. mandatory minimum sentences) impose costs primarily on the provinces rather than the federal prison system. Which means that while today's news may reflect some of the costs of being dumb on crime, it only scratches the surface as to how much money the Cons have set on fire for the sake of sheer politics. This summer has seen plenty of crowing from the right over a connection between "economic freedom" (as defined by various corporate think tanks) and GDP levels. But for those of us who see obvious problems with treating GDP as the sole measure of a society's accomplishment, that raises an obvious follow-up question: how do the measures of economic freedom stack up against a society's inequality (which of course has much more to do with social well-being than GDP levels)? We're probably a long way from conclusively answering that question. But let's take a quick first look. 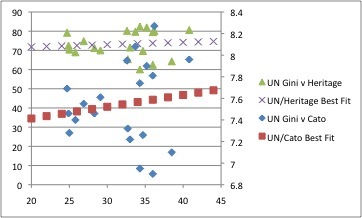 The chart below contains information from three sources: the most recent UN data on inequality as measured by Gini coefficient (from 2007-2008), and the 2008 economic freedom indices from the Cato Institute and Heritage Foundation. The country set is identical to the one used by Richard Wilkinson and Kate Pickett in The Spirit Level. I'll leave it to others more statistically-inclined to look at the question in more detail. But based on at least a first back-of-the-envelope chart, there appears to be a small but direct correlation between inequality and the type of corporate-friendly policy that's constantly pitched as somehow necessary to support social gains. And if we can say that decisions about "economic freedom" in a developed country are based on a trade-off between equality (which has been shown to correlate to scores of key social outcomes) and GDP (which hasn't), then there's ample reason to think the right is on the wrong side. - While I agree with Murray Dobbin's latest to a point, I'd think it's worth clarifying exactly what kind of fight we can and should expect from the NDP over the next four years. To the extent one considers a "culture war" to mostly involve the U.S. issues normally linked to the term (abortion, gay rights, separation of church and state, etc. ), I'd think the deciding factor in the NDP's strategy will be the Cons' actions. And while any attempt at backsliding in those areas needs to be met with a furious response, I wouldn't see the NDP getting any further than the Libs if it tries to focus on them at the expense of what's being discussed by the Cons and the media. Which means that for the sake of clarity, I'd think the better term for the NDP's ideal plan is a "values war" - consisting of a clear clash of ideas including, but not limited to, what's normally considered to be cultural conflict. And I'll certainly agree with Dobbin that the measure of the NDP's success will be its ability to build a movement to overcome the one the Cons have developed on their side of the spectrum. The privatization of the Australian Wheat Board has set a bad precedent of what might happen once monopoly powers are removed. That marketing entity couldn't compete, was subsequently sold to private companies and has disappeared. Most anticipate a similar fate will face the CWB once its monopoly powers are removed. Time will tell if eliminating the CWB monopoly will put an extra dollar in a grain grower's pocket. Those located far from the U.S. border and seaports will find their grain shipping costs dramatically increased. And as with so many surplus farm commodities, producers may well find themselves competing for the lowest price. At least the CWB was able to mitigate and average out that all too usual practice. The surefire loser in this change will be the taxpayer. When the U.S. launches its inevitable trade actions against an anticipated flood of Canadian grain into American border grain elevators, it will be the Canadian government that will have to pay the bill to fight those actions, not the diminished CWB. The CWB also carries liabilities of millions on past sales that went bad, and of course, it carries employee pension and severance liabilities that could exceed $100 million. The government may try to prop up a new CWB to avoid facing those realities, but somehow you just know the taxpayer will be on the hook. I guess for a few, it's a small price to pay for one of the founding ideological goals of the Reform and Conservative parties. While the arguments about network congestion from dominant providers such as Bell remained much the same, as the week wore on it appeared the commission was beginning to realize that congestion claims may be overstated and being used to mask fears of competition from the independent ISPs. The CRTC commissioners appear to have recognized that proposals based on limiting the volume of Internet use are not only bad policy — discouraging Internet use benefits no one — but are ineffective in dealing with network congestion. The reason is that the amount of data consumed has very little to do with whether the network is congested. Consider a four-lane highway that can comfortably accommodate 24,000 vehicles per day. If the vehicles are spread evenly at 1,000 per hour throughout the day, there is no traffic congestion. But if 20,000 of the vehicles attempt to use the highway over a four-hour period, the highway becomes very congested during that time frame. The aggregate volume of traffic may be the same, yet the congestion implications are very different. The same is true of networks, which can be used to capacity without congestion concerns. It is only when there is simultaneous demand — called peak periods — that there is the prospect of congestion and the need to augment the network. Pricing to peak periods is precisely what the independent ISPs have proposed, noting that volume pricing hurts their competitive flexibility and does little to address congestion. - Finally, Erin picks up on the fact that the TILMA which the Wall government promised not to sign is has been entirely rolled into Wall's WEPA. (T)here is another view that we now seeing a very different NDP campaign ... and perhaps even a very different Dwain Lingenfelter. The NDP leader, elected two years ago to heap damage on Wall and the Sask. Party in the hopes of beating them in 2011, is now all about nurturing the party's roots for its comeback in 2015. There are signs that Lingenfelter is forgoing his summer vacation to try and do just that. "When I came back to run (as NDP leader), I knew very well that winning this election would be a long shot," said Lingenfelter in a telephone interview during a lunch stop at a diner south of Blaine Lake. But Lingenfelter said he felt he owed it to the party and the province to help rebuild and mentor the next generation within the NDP. "That's the longer view and that part seems to be working," he said. His detractors might be unwilling to accept that this is his approach, but the odometer on his car may suggest otherwise. In June and July, Lingenfelter has made more stops than the party has put out press releases, Some of these 25-odd stops might be expected - target-rich environments like Regina, Saskatoon, Prince Albert, Moose Jaw, and North Battleford, where the NDP is trying to hold on to or gain seats. But others, like Estevan, Lloydminster, Lebret, Shellbrook, Yorkton, Melville and Big River (which Lingenfelter says he's visited six times) see Lingenfelter venturing into Wall's rural stronghold where NDP candidates have less of a chance in November. The NDP leader also insisted there is a sense of urgency on the ground in local NDP constituency campaigns where candidates have been working hard and are far better positioned than they were in 2007. He says his summer tour has been about providing support for those campaigns and reconnecting with NDP voters in hopes of everything falling into place this fall, or in re-establishing a foothold for down the road. It's not quite a concession that the NDP can't win in November. No leader would ever do that. But there is a sense that it's also about 2015 for Lingenfelter and the NDP. Let's deal with two of Mandryk's implicit claims: that Lingenfelter's focus on engaging with rural ridings is a new development, and that it represents a strategy based on building the NDP primarily for 2015 and beyond as opposed to 2011. On the first point, I'm not sure how it could have escaped Mandryk's attention that Lingenfelter made a priority of personally travelling to rural ridings starting with the NDP's leadership race - where he both made a point of visiting each of the province's 58 ridings, and committed to doing the same again upon winning the leadership. But there shouldn't be any surprise in that forming a significant part of Lingenfelter's organizational philosophy - even at a time when his core message was based on the goal of winning this year's election. More importantly, though, I'd think that some effort to cultivate support around the province makes for a better strategy for this year alone than retreating to a much smaller set of ridings. Even at the best of times, I'm not sure it's often a viable strategy to ignore 40% of the province based on the hope that every single one of a small list of targets will turn in a party's favour. But the calculus is especially stark for a party seeking to topple a sitting government. After all, the NDP is a position of needing to win over voters who weren't in the party's column in 2007 in order to add seats to its current total. And while the easiest single path might be the one that involves the 10 seats where the NDP was closest in 2007, there may be multiple ways of getting to that point which the party would be foolish to ignore. And even if the NDP can't shift rural seats, it also needs to work on changing minds throughout the province in order to be able to tap into enough positive public sentiment to win votes. And that effort will be far easier if the Sask Party can't count on being substantially unopposed in large parts of the province. Of course, it's also true that increased party engagement figures to result in benefits for the party in the longer term. And it's for the best if the NDP is keeping those considerations in mind as well - particularly since many of the Sask Party's recent rural walkovers are likely traceable to the NDP's adopting the opposite strategy when holding power was seen primarily as a matter of defending existing turf. But I'd see those side effects as a bonus, rather than the sole or even primary motivation for putting in time and effort in rural Saskatchewan in an election year. And we shouldn't assume that long-term considerations are winning out over shorter-term ones where both might well point to the same strategy. Let's start a quick post on yesterday's game with a bit of relative optimism that figures to be lacking among 'Rider fans. Yes, the drubbing at the hands of the Tiger-Cats made for the team's first truly poor all-around performance of the 2011 season. But the relative strength of the two teams wasn't anywhere near as bad as the final score made it appear. As poorly as the 'Riders performed offensively, they did manage to drive the ball into the red zone several times, while also posting a couple of near misses which didn't show up in the game stats. Which means that even after an almost completely ineffective first half, the 'Riders' embarrassingly low point total had as much to do with turnovers and strategic considerations (in trying to come back from a huge deficit) as with any obvious structural problem with the team's offence. And Saskatchewan's defence actually played better than it had in the team's previous two games. Indeed, it combined at least some level of pressure on Kevin Glenn with relatively sure coverage and tackling to keep the game close in the early going, then hold the Ticats short of the point totals posted by Edmonton and Hamilton in the 'Riders' first two games. All of which is to say that contrary to some of the frustrated comments following the game, the 'Riders are still a long way from the down times of years long past. No, the 2011 team isn't a true bottom-feeder which gets dominated in the trenches on both sides of the ball to the point where the efforts of the team's skill players seem irrelevant. Instead, yesterday reflected a game where the breaks went almost entirely the Ti-Cats' way to overwhelm the effects of a mostly evenly-matched contest - and a couple of relatively subtle changes (say, the 'Riders being the ones to convert on their chance for an early interception on their opponents' end of the field, and Darian Durant's out-of-bounds bomb to Weston Dressler connecting) could easily have changed the complexion of the game. Of course, that doesn't mean the 'Riders don't have plenty to improve after a bad loss against a team which was also at the bottom of the CFL standings. And it's particularly worrisome that the offence which has been the 'Riders' relative saving grace produced next to nothing until the game was out of reach. But while there's an awful lot to be done to fix mistakes in all phases of the game, the 'Riders have at least showed enough in the first three games of the season to suggest there's still hope of getting there. And it'll be up to the team's coaching staff to keep the focus on what can be done, rather than letting frustration drive the team to the point where it truly isn't competing. The most important objection to TILMA is that it allows business to sue provincial and local governments for up to $5 million over laws, regulations and policies that allegedly have negative side-effects on economic activity or investment that happens to cross a provincial border. These challenges are adjudicated behind closed doors by commercial tribunals, rather than through the normal court system. This sweeping “solution” is rather extreme compared to the supposed “problem” of interprovincial trade barriers. Very few such barriers have been identified and governments have a good track record of resolving them on a case-by-case basis. The Royal Commission on the Economic Union and Development Prospects for Canada estimated that interprovincial barriers cost under 0.05% of GDP in the 1980s and most have since been removed. After failing to convince any other provinces or territories to join TILMA, its supporters have been implementing it through the back door. In July 2008, Premiers added financial penalties of up to $5 million to the Agreement on Internal Trade, which covers all provinces and territories. Ministers agreed to undertake a more effective enforcement mechanism under the Agreement on Internal Trade for disputes brought by “persons” (individuals, businesses and other organizations) against a government. . . . The changes agreed to today include monetary penalties . . . These are largely based on the new process applicable to disputes between governments which was put in place in 2009 [i.e. the fines of up to $5 million announced in July 2008]. The good news is that these changes are still just general proposals. The Committee of Ministers on Internal Trade plans to actually amend the Agreement on Internal Trade at its June 2012 meeting. So, we have a year to stop it. (T)here has been little discussion in Canada about the proposed Comprehensive Economic and Trade Agreement (CETA), which is perplexing given the far-reaching implications for this country of any pact with the EU. We’re talking about a trade deal that in many ways is as big as the North American free-trade agreement and, in several instances, poses potential problems for Canadians as serious and disturbing as any in the 1994 accord with the Americans. For starters, the deal could add nearly $3-billion a year in costs to Canadian drug plans – including $250-million in B.C. and $1.2-billion in Ontario. This is because it would delay our access to cheaper generic drugs by several years. Among the CETA perks that Europeans are eyeing is the right to bid on government work in Canada – in other words, those contracts tendered by provincial and local governments in Canada that now mostly go to local companies. CETA would end that preferential practice. Think about that for a moment. And then consider the many local governments across the country that use procurement as a tool to promote economic development. A reported 60 per cent of municipalities in B.C. have economic-development strategies that include local procurement and hiring. It all seems odd. During the NAFTA talks, Canada had an on-going national debate about the merits of that trade deal. And yet, for a trade pact that some argue is even bigger in scale, there is a deafening silence across the land. Canadians have virtually no idea of what is being negotiated on their behalf. They should. The stakes are enormous. When you put the private drug plans under the microscope, instead of seeing efficiency and cost effectiveness in prescribing -- compared to public drug plans -- you often find the opposite. A few years ago my colleague Dr. Joel Lexchin and I published an analysis of the top 10 most expensive drugs paid for by private drug plans in Canada and we found that the plans were spending about 25 per cent more than they needed to, compared to a basket of equally effective, but less expensive medications. In fact, according to a recent study in the Canadian Medical Association Journal if drugs in the same class as Diovan (drugs known as ARBs) had been restricted by drug plans in favour of drugs like Ramipril (a class of drugs known as ACE-Inhibitors) then the Canadian health system would have saved more than $77 million in 2006 without any adverse effects on cardiovascular health. Your private plan automatically covers drugs like Celebrex, Januvia and Diovan, no questions asked. Me? I'm glad that public drug plans appropriately keep coverage of those drugs limited to only those people who need them. It's clear what is going on here: employees who get private, and unrestricted drug coverage are facing escalating costs. According to the Canadian Institute of Health Information, private plans are growing at about twice the rate of public drug plans. Private drug plans are often managed by insurers who get paid as a percentage of the cost of the scripts they process, so there is no incentive to seek 'value-for-money' arrangements. In the end, employers absorb those rising costs while denying the workers raises. (When) you fix problems where none existed, you often create a bigger mess than the illusory one you think you’ve solved. That, unfortunately, is where last year’s boneheaded decision by the governing federal Conservatives to scrap the long-form census has left the country. The problem with voluntary surveys, experts explained, was that certain groups, including the poor, the rich, aboriginals and immigrants, tended to avoid filling out such questionnaires when they were not mandatory. As a result, important decisions regarding taxpayers’ money would, in future, have to be made while relying on somewhat skewed data. The Conservatives, as we know, stubbornly refused to listen. Now come reports that, as expected, many people asked to fill out the new National Household Survey by Statistics Canada this summer have either chosen not to do so or only partly completed the questionnaire. This, say experts, will make the resulting data, though still usable, less reliable than information collected for many years using the old long-form census. The impact of this disastrous decision will unfold slowly but last for many years. Meanwhile, Statistics Canada is only now examining other alternatives for getting the needed data. That, however, should have been the first step.